It has always been about the place. Without the fortuitous geological formation of an underwater reef during past eons, just offshore from a steep, sandy, south-facing beach on the bulbous spit of land called La Jolla, none of this would have happened. But it did. The earth cooled, the reef formed, the ocean levels rose and settled with the ages, the summer south swells came, and the first intrepid wave riders who took the time to look noticed how perfectly the waves broke there, peeling left and right from a peak, with deep water channels surrounding it, and a thick kelp bed growing offshore to smooth the surface of the waves. It's a glorious and beautiful place, this beach we call WindanSea. But it has to be about the people, too. Without the people, there would be no Club, or any surfing at all, for that matter. I often wonder what the first Native Americans might have done at this spot. Were they too busy just surviving, hunting and gathering food, finding shelter from the weather and sun, to ever play in the perfect waves that broke there? Was the leisure time that we enjoy nonexistent, or just too precious of a commodity back then? Or did they swim out and bodysurf the waves once in awhile, perhaps steer their dugout canoes down the face of a soft swell when returning from a fishing trip, or even fashion a crude plank with which to slide on the waves as the ancient Polynesians did? Without a time machine, we may never know. The totality of recorded history is just too brief an interval, and the history of modern surfing even less well known. We do know a few things, though, and it all begins with the introduction of the Hawaiian sport of kings to California by Duke Kahanamoku and George Freeth in the early 1900s. It was their demonstrations of surfboarding that sowed the seeds of modern surfing in Redondo Beach, Corona Del Mar, and Balboa Beach, from where it spread north to Santa Cruz and south to San Onofre and San Diego. The first known surfing at WindanSea took place in the 1930s, with people like Don Okey, Bob Barber, Towney Cromwell, Dorian Paskowitz, Buddy Hull, Woody Brown, John Blankenship, Jack Lounsberry, and Fred Kenyon, Sr. They were the original locals, known as the "Plank Boys," for their huge boards carved and laminated out of solid redwood, fir, and spruce planks, although Woody Brown built some of the first hollow "kookbox" designs, originally created by Tom Blake, during this period as well. World War II intervened in the early '40s, emptying the lineup, as most able-bodied men and women joined the armed forces or merchant marines to serve their country, or went into 3-shift factories pumping out the tools of war, gas was rationed, and the next crew of youngsters, like Woody and Carl Eckstrom, often found themselves surfing alone at WindanSea. It wasn't until after the war that the WindanSea community coalesced again, beginning to grow with the addition of GI's released from service and looking for recreation. The waves at WindanSea drew such surfers as Jim "Burrhead" Drever, Dempsey Holder, Gard Chapin, "Skeeter" Malcolm, "Black Mac" McClendon, Chuck "Gunker" Quinn, Rod Luscomb, Bill McKusick, Bob "Goldie" Goldsmith, Al Nelson, Wayne Land, "Tiny Brain" Thomas, and finally, the eccentric and inscrutable genius, Bob Simmons, who migrated from the Los Angeles area and met his demise there in 1954. The first manifestation of an organized but informal surfing "club" came in 1946, when the original shack was erected at WindanSea, and the Plank Boys began putting on annual Polynesian Luaus there, which became hugely popular social events for surfers up and down the coast. The shack was destroyed in a winter storm in 1949, but Kenyon and Okey rebuilt it the next year, with help from the other local surfers. 1950 marked the end of the annual Luaus, as these gatherings had grown to rowdy and unruly proportions, attracting the attention of the local authorities. During the '50s, a new, younger crew developed around the time when lightweight materials of balsa and fiberglass revolutionized surfboard design, with Simmons' design and construction innovations leading the way. Surfers like Buzzy Bent, Jim Fisher, Pat Curran, Mike Diffenderfer, and Ricky Grigg paved the way for a new crew of up and coming groms, which included Butch Van Artsdalen, Mike Hynson, Skip Frye, and the Patterson brothers, Raymond, Ronald and Robert. In the late '50s and into the early '60s, surfing's popularity exploded in California (and around the world) due to two well-known factors: the development of the lightweight polyurethane foam and fiberglass surfboard, and the publication of a best selling book, later to be made into a big-time Hollywood movie, named "Gidget." Those who had grown up in the sport prior to 1957 were dismayed by the increasing hordes of new surfers unleashed by this cultural phenomenon, as crowds were growing exponentially as the years passed. The locals at WindanSea reacted to this overcrowding with a bit of an iron-fisted attitude of protectionism and territorialism. Ask Bill Andrews someday what it was like to come over to surf WindanSea from the Shores in the early '60s, if you want to be entertained for a few hours by some good stories. 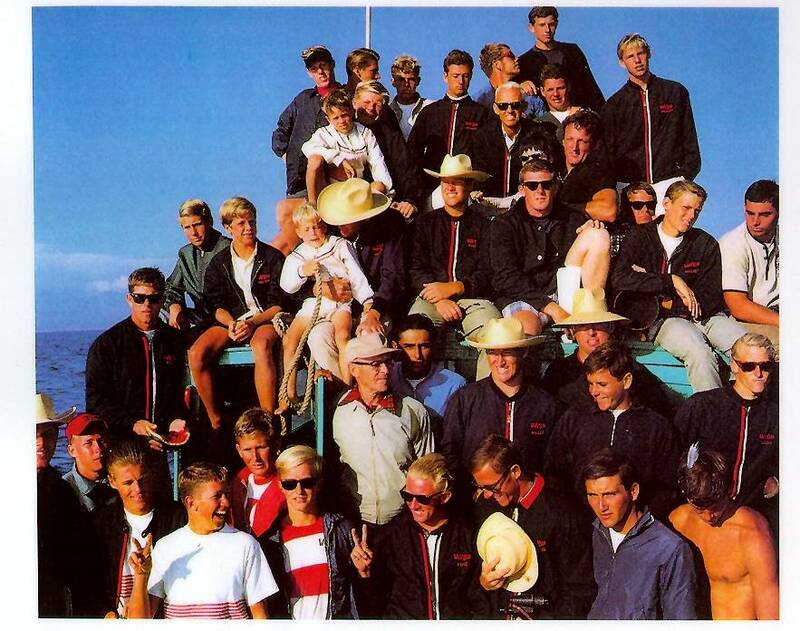 It was competition, though, that gave birth to the current, formal incarnation of the WindanSea Surf Club, as the growth of surfing spawned contests to compare skills up and down the coast. One of the biggest events in California at the time was the club competition held at Malibu. In 1962, Chuck Hasley, who had moved to San Diego and opened a surf shop in Pacific Beach for Hobie Alter, was talking to Skip Frye, Mike Hynson, and Bill Caster about the contest, and they decided to recruit a team to surf under the WindanSea Surf Club banner. Although they had only a loose connection to the previous club, Chuck guessed correctly that some of the L.A. guys would remember the Luaus and figure that they were an established organization. Working with Thor Svenson, who had been meeting with Larry Gordon and Bill Andrews since 1961 with the idea of creating a premier San Diego surf club, and who provided a great deal of the political acumen and organizational skills necessary, the newly reconstituted club quickly fielded a team of Joey Cabell, Ronald Patterson, Dave Willingham, L.J. Richards, Skip Frye, Mike Hynson, Del Cannon, Chuck Hasley, Billy Caster, and Rusty Miller, who piled into a rented bus and arrived at Malibu to dominate the contest. After that, word-of-mouth spread quickly, and the club recruited the most talented surfers locally and from around the state, adding world-class surfers like Miki Dora, Mike Doyle, Phil Edwards, Donald Takayama, and hot young juniors David Nuuhiwa, Corky Carroll, and the phenomenal Margo Godfrey-Oberg to the roster. In 1965, the Club incorporated as a non-profit organization with the stated goal of "promoting the sport of surfing and the positive image of surfers as athletes and good citizens, through the sponsorship of competitive surfing events and charitable community activities." They sent teams to the Makaha and Duke International contests for several years with great success, winning both surfing and paddling championships, and established an international presence with Hawaiian, Mexican, and Australian branches of the club. Members traveled to the South Pacific and Australia to compete in contests and star in the surf films of the day. The Menehune Contest was started in 1965, in order to give emerging talent among the local groms a venue to compete, and it continued annually until 1971. The mid 1970s saw a shift in attitudes away from competition and into "soul surfing" for a time, people were off "doing their own thing," and the club entered a period of dormancy. Thor Svenson relocated to Australia, and without his leadership, the organization stumbled. Finally, in 1981, Steve Shaw, Bill Andrews, Jeff Junkins, Dave Mc Intyre, and former Women's World Champion Debbie Beacham revived the original non-profit corporation, and along with many of the original charter members, re-established the club in its current incarnation. The competitive heritage of the club continues today, as the WindanSea Surf Club has dominated the Coalition of Surfing Clubs contest circuit for the last 6 years, and our current membership includes many successful professional surfers and past champions, including Kelly Slater, Joel Tudor, Peter King, Joe Roper, Richard Kenvin, and Saxon Boucher. The elements of charity and community involvement are still being fostered with the club's sponsorship of the annual "Day at the Beach" events for homeless children from the St. Vincent de Paul shelter and the Casa de Amparo, as well as teaching the local Special Olympics athletes how to surf, providing water patrol for the La Jolla Rough Water Swim, and working with the La Jolla Recreation Center to put on their Halloween festival for local kids, among other activities. The WSC Menehune Contest was revived in 1999, and this year will mark the 7th running of this traditional event in the "new era" of the club. Good luck to all the Competitors!